It is expected that lecturers will manage the learning of their students and select which experiments out of the large collection available in LiLa will be used for teaching and training in their courses. If these experiments depend on hardware resources, these resources must be made available to the students; that is they must be Reserved. Reservation requires contact with the content provider, in most cases the creator of the experiment, to obtain a booking code from her or him. This booking code is valid for an infinite number of student bookings within a given time period. At their discretion, the LiLa booking system allows the teacher to divide this time slot up into several slots which students can book individually. In the simplest possible use case, the entire time slot reserved by the content provider is handed over to a single, large group of students, though more complicated setups are possible. For example, you as the teacher may give two lectures, both requiring the same experiment. In this case, you would probably want to break up the time slot granted by the content provider into two slots, one for the first and another for the second student group. This ensures that the two groups cannot conflict with each other. Last but not least it is usually best to provide access to the experiment in your Institution’s own Learning Management System, together with all the teaching material you provide, i.e. lecture notes, assignments, etc. This step requires that you download the experiment from the portal and upload it to the LMS of your university. If your university does not use a learning management system, you may, of course, direct students to the LiLa portal as well. You are now redirected to the "where are you from" page. 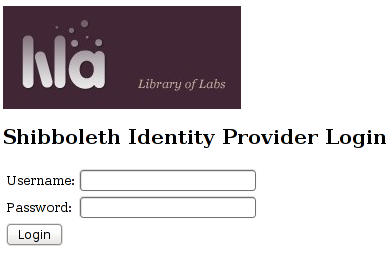 LiLa is based on the Shibboleth federated identity provider system, and as such, requires you now to select your identity provider. If your identity provider is not available for selection there, please select "LiLa IDP", and contact your LiLa representative to create an account on our system - or to add your identity provider to the list. Log in using your name and password. After logging into the portal, you will probably want to browse through the available material and search for experiments you consider useful. A searchable database can be accessed by clicking the Explore button on the portal home page. Depending on the experiment, it will either be able to run directly - if no booking is required and the experiment is only a virtual experiment requiring the resources of your own computer, - or it will require a valid reservation. Such activities are discussed in the following section. While virtual experiments are available any time to anyone and ready to use directly, remote experiments require booking as the corresponding hardware resources have to be shared between several, possibly even hundreds of users. This step is called reservation or booking and requires two actions from you, the lecturer. First, you need to request time on the corresponding hardware, i.e. the Rig owned by the content provider. It is up to the content provider to assign you a time slot, and it is up to you or your institution to negotiate this with them. The outcome of this step is that the content provider will provide you with a teacher booking code for the corresponding experiment. Note that this booking code is not only available for the experiment itself, but is also valid for any experiment that runs on the same hardware. That is, you, as a teacher, book the Rig rather than the experiment or software package. In a second step, you can break up the time slot you got from the content provider into several time slots which you can provide to the students. In the simplest possible case, the entire experimentation time reserved on the rig is passed over to a single group of students within which they are able to book. If you are lecturing several courses, or are administrating or coordinating the teaching activities at your institution, you might want to follow a more sophisticated approach and then split this time slot up into to several individual booking slots, i.e. one per class or one per group of students. For example, if you lecture two classes of physics - one on Tuesdays and a second on Thursdays - you will probably want to create two booking periods, one for the Tuesday and one for the Thursday student group. You assign each student group a (new secondary) student booking code. This booking code is distinct from the teacher booking code which you received from the content provider, and cannot be further subdivided. While in principle you can set the student and teacher booking codes to be the same, this is discouraged unless you wish to give the students the freedom to break up the time slots themselves. You can communicate the booking codes to the students by any means you see fit. Students can now reserve time on the experiment with the booking code they received, but only within the slots the booking code has been created for. The last step is actually the easiest, namely downloading experiments. While you may in principle send your students directly to the LiLa portal, doing so may not be a good idea because this separates the learning material you provide with your lecture from the actual experiment. Unless your institution doesn't host a Learning Management System, it is considerably simpler for your students to access experiments along with your lecture in the LMS of the home institution. Typical examples of such systems are Blackboard, Ilias or moodle as well as any other SCORM compliant LMS; all of which are supported by LiLa. Booking and access control to the experiment is automatically handled by LiLa, simplifying the deployment of experiments considerably. Locate the experiment you need on the LiLa portal. For this, follow the steps described above. You then receive a ZIP file containing the experiment. You should NOT un-zip or open this archive; it is - as it is - a complete learning object ready for deployment in your learning management system. First, navigate to your course and locate the Add new Element button. From the menu, pick "SCORM/AICC" as type. 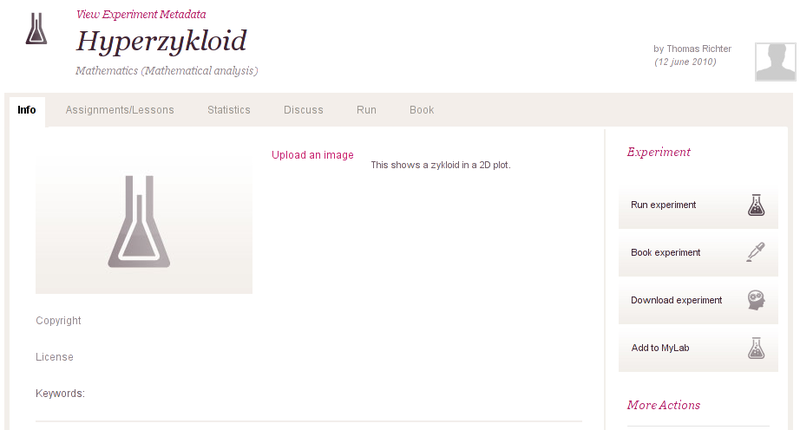 You are then directed to the upload page of Ilias. Click on the Browse button, and select the file on your desktop you just downloaded from LiLa minutes before. Click on Import. This is the same page that your students will see, and this is inserted automatically by LiLa to restrict access to the experiment whenever it is not booked. If you already created booking codes for students you may now enter one of these codes to reserve time on the experiment. Note, however, that you will not be able to use the experiment before the reserved time.